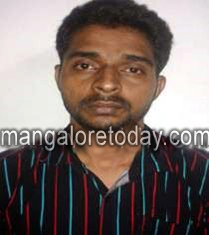 Mangalore, Aug 4, 2014: It is reported that the city crime branch (CCB) police on August 1 was fortunate to nab absconding goonda Imran, who is said to have been accused in several cases of murder , more than eight years after his escape from police detention at Bappanadu under Mulky police limits. On getting information of his arrival at Mangalore Jn railway station the CCB police got hold of the accused in a neat operation. Primarily Imran is an accused in the murder of Rakesh Kola, a cable operator killed near Udupi Residency hotel on 21 September, 2003. Siraj Hasan, Yuvaraj Tingalaya, Gopal Bangera, Riyaz Sheik and Imran were booked in the case. Imran was lodged in the district jail in Mangalore. On November 21, 2005, Imran who was held in the M’lore district jail was being taken to Udupi court for hearing with other inmates. While on the return at Mulky, Imran requested the police to allow him for nature’s call. The police allowed him as soon as he was out of the van he took to his heels and was never seen. Cases were booked in this regard too. The capture was made by CCB inspector Valentine D’Souza, along with other CCB police , Shashidhara Shetty, Ganesh, M P Ganesh Kalladka, Venugopal, Chandrashekar, Dinesh Bekal and so on. It was a day of good fortune for the police and misfortune for Imran.